There are few places in the world quite like Argentina and Brazil, especially when it comes to street art. The combination of talent, friendly laws, and a rich, varied and vibrant history has given birth to some of the best and brightest talents in the world. Simply walking down the streets of Sao Paulo or Rio de Janeiro will give you a sudden and delight insight into the many talented artist roaming the streets. But if you’re in Buenos Aries, you will be sure to notice the work of one Martin Ron, a street artist whose international acclaim is only growing. Martin Ron’s work is noted first and foremost for its size. The motto “Go big or go home” seems to be a mantra for his work, which often towers above the smaller pieces that dot Buenos Aries’ skyline, alleyways, and neighbourhoods. Of course, usually such size also brings with it time savers, ways in which people can make a larger project while being able to get home at the end of the day. For Martin Ron, this is not the way to do things. Besides the size, Martin Ron’s work is noted for its deep complexity in terms of colour, subject, and detail. Everything he does is painstakingly researched, created, and given a perfectionist’s level of attention to detail. From turtles bursting forth from walls to Dali-esque surreal takes on skater culture, everything looks at once real and artistic. Take, for example, this piece. It taps not only into a larger artistic history, the influence of Salvador Dali’s surrealism is immediately evident, but it does so by considering the local skater culture and South American’s classic love of vibrancy, both in subject and in colour. Four stories tall and using three different sections of a building, the piece is astounding in its scope, size, and ambition, all of which have become the norm for Martin Ron. What Martin Ron’s art shows us is more than an ability to compose larger, and larger-than-life, art, it shows us how vibrancy and taking into account one’s own history can lead to beautiful works of art. Too often, we think of artists as singular geniuses who completely change everything, but to do so often erases the people who came before. With Martin Ron, we can see brilliant nods to the past as history is being made right before our very eyes. It takes a measured approach and celebrates art history, the area around the drawing, and the characteristics that make South American street art, and Argentinian art in particular, such a fascinating part of the global street art phenomenon. The small island nation of Malta is famous for many, many things. It has long been a favourite destination of tourists, with its warm climate, cool ocean breeze, and beautiful scenery. It’s been a favourite place for other nations to take over as well, given its favourable location, and has been occupied by almost all of the major players of Europe at one time. But since 2013, Malta has been occupied by something much cooler than old European brigades. It’s been taken over by street artists. The Malta Street Art Festival actually started elsewhere on the island, in the town of Sliema as the Sliema Street Art Festival. The smaller town feel, even in one of the world’s smallest and most densely populated countries on the planet, made an ideal location: more space to spread out, far enough away that people would travel away from the nation’s capital to see the art, and an opportunity to create a tight-knit community. The small start worked wonders and, in 2013, the festival’s community decided to take over the capital of Valletta, expanding out so that the impact and festivities could be experienced by even more people. And so the Sliema Street Art Festival turned into the Malta Street Art Festival, and with the new name, things began to grow and change. The festival in Malta was a bigger affair than previous street art festivals in the area, and has since grown outside the realm of just street art. All along the promenade, the festival set up four stages where local and visiting musicians played anything from reggae to rock and roll. A market for local vendors was also set up, letting locals sell their creations and giving visitors a chance to leave with more than photographs of the stunning artwork being made. The extra space afforded by moving to Valletta gave the organizers a chance to create a skate park directly on the beach, which local skaters and riders used during the three-day festival set in the heat of the summer sun. Another cool thing they set up was a series of cars and trucks along the seafront, which artists could give a fresh coat of paint and give the vehicles a truly unique look. For the 2015 festival, the organizers decided to go with a theme that strikes home for Malta: knights. Since the island nation has a long history of military incursions, it gave artists a chance to dive deep into what makes Malta a unique country in history. A literal battlefield was present and light shows were put on to entertain and amaze. Street art festivals, like the one in Malta, show how international and inclusive street art can be. It’s more than simply putting paint to a wall. It’s about fostering a community, celebrating local flavours, and giving people the space to express themselves creatively, whatever their chosen medium may be. And with the Malta Street Festival, that feeling will hopefully be around, every summer, for years to come. Donald Trump has long been a controversial figure, from his rise in the eighties as a real estate and property mogul to his recent bid to become the President of the United States of America. He’s long been in the public eye and, at this point, is quite comfortable in front of a camera, a pulpit, or a boardroom filled with cameras. And with so much notoriety, The Donald has also gained the attention of some very talented, and very angry, street artists. Graffiti, as it is sometimes pejoratively called, has also been closely associated with declarations, whether they’re political, territorial, or simply making a statement. Being illegal in so many different ways, it can also be a political statement through its very existence and, in the way that many people see it during their daily routine, its ability to capture an audience is similarly a political act. For some, the politics is key, and now that Donald Trump has decided to try and become one of the world’s most powerful people, artists are flocking at the chance to show off what they really think of him and his bid to become president. Hanksy’s message will certainly have some detractors, but many people in New York have long had an antagonistic relationship with the owner of Trump International. Trump, and his extremely wealthy father before him, invested in multiple real estate initiatives that are tied to the gentrification and extreme, now legendary, housing prices in New York, and many people are sure to enjoy Hanksy’s take on Trump. Trump’s campaign and infamy has made its way north of the border as well, with a Winnipeg artist giving visitors of a local pub’s men’s room something to ponder while they pee. The District Stop nightclub in the city’s Entertainment District features a painting of Trump, but with his mouth as one of the urinals. It was designed as a statement and publicity stunt, and it’s now international fame is certainly making people stop by. Street art has always been political, so for artists to take their graffiti and point it at such a controversial figure is no surprise. And whatever your opinions about Trump are, it has at least led to some interesting art pieces around the world. They do certainly have a theme, though, one that may not be too far off the mark. In the quiet town of Chattanooga, Tennessee, there is an old AT&T building. It sat quiet, much like the town, for years, a grey set of blocks in a wide parking lot. It was functional, but the exterior became an eyesore for the nearby residents. And for one artist, it became an opportunity to talk about important issues, and share some beauty with a small Tennessee city. The City of Chattanooga saw the building as an opportunity rather than simply a problem, and the result was a mural that’s as interactive as it is tied to American history. Chattanooga contacted nationally-praised artist Meg Saligman for the project, raising over $200,000 in the process to help her create something beautiful, significant, and appropriate. The project, after all, involved an entire building, not simply a single wall, and that meant Saligman was going to need time, supplies, and help. The project allowed Saligman the opportunity to hire six Chattanooga artists to help, giving them valuable paid professional experience and the opportunity to work on a collaborative project in their hometown. Saligman’s design for the mural was inspired by Martin Luther King, Jr. and was unveiled on January 18, 2016, three days shy of what would have been the civil rights leader’s 87th birthday. Saligman took inspiration from the renowned leader and decided that the mural should engage the audience on multiple levels. With a project of such magnitude, creating activities, it seems, is a good way to keep an audience looking. She used Martin Luther King, Jr.’s “I Have a Dream” speech as inspiration for some activities, recreating metaphors and visual imagery found in that beautiful and important speech. Nines were also hidden throughout the mural on all sides of the building, and familiar faces from the period were used. As for the artist herself, Meg Saligman is a living legend in the public art community. Named one of the ten most influential American muralists of the past decade by the Public Art Review in 2006, she has won numerous awards and created projects around the country. She specializes in absorbing local styles, mostly by collaborating with local artists, to bring something to the public that is both familiar, given it is part of their community, and created with intent and serious artistic talent. The results, as the citizens of Chattanooga can attest, are outstanding. Saligman’s mural in Chattanooga demonstrates two key things about public art: its ability to capture and hold attention and the importance of collaboration. With Saligman, she chose to use local artists to create something meaningful for the city, acting as a project manager to help some of the city’s artists create a piece with local flavour. The end result also shows the many ways that artists can grab and hold attention, whether it’s through facial recognition, familiar imagery, or even a small game of “spot the 9s.” Art without an audience, especially public art, can often miss the point. Andy Warhol accomplished many things in his lifetime. He brought pop sensibilities to high art in a way unseen before his arrival. He made movies that made people go to the art gallery. He even cultivated the career of one Lou Reed, one of New York’s most beloved musicians. But one thing that Warhol did, intentionally or not, was change what people consider art, and how much they’re willing to pay for it. Consider it: Warhol made an entire series of paintings which are essentially copies of Campbell’s soup cans, one of the most common items in the entire world. These paintings have sold for millions of dollars. They have become iconic pieces and owning one would be like owning a piece of American history. In 2013, Banksy seemed to accomplish the exact opposite: taking something worth millions and selling it for pennies. A humble art shop was set up in New York’s Central Park when Banksy was doing a high profile yet very secretive tour of the city. It was full of Banksy originals and prints, all for sixty dollars. There were three signs: one said “Spray Art,” another the price, and a third simply stating “This is not a photo opportunity.” Run by an older man in sunglasses and a hat, the store was only open for a single day and sold a total of eight pieces for a grand total of $420. Half of the sales came from a man from Chicago who “just needed something for the walls” of his new apartment. One lady bought two pieces for her grandchildren, managing to haggle a 50% discount from the shopkeeper. Banksy’s work has always, in some way or another, a commentary on the economic systems surrounding art. He became famous for his stencils, freely given, on the streets of England and, later when he decided to have his Central Park art sale, New York. His Dismaland attraction charged an entry fee, but it was nominal and the uninterested guards probably wouldn’t have stopped you. But the way his work becomes part of economics is interesting as well: a single mom who awoke to discover Banksy had painted a piece on the side of her house ended up selling the section of wall for five figures, helping her climb out of debt and start anew. And even his Central Park art show would be a chance for someone to make an insane profit: sixty dollar pieces that are easily worth thousands. 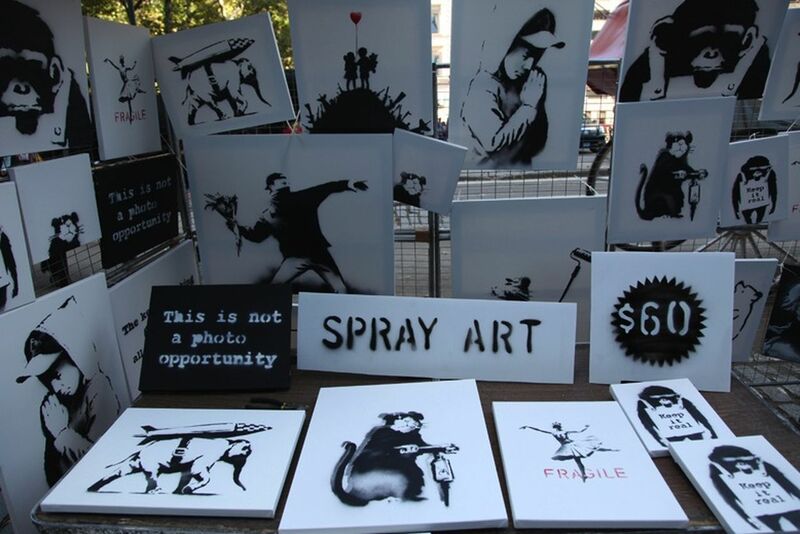 Banksy has never been shy about discussing economics and art, whether it’s in his street art pieces or efforts like “Exit Through Gift Shop” or this pop-up shop in Central Park. His approach says something about the importance of access when it comes to art and artistic expression. While much of today’s art sits in galleries, exclusive events, and parties for the social elite, Banksy and other street artists continue to make efforts to provide art for everyone. All it takes is a stroll outside.